It's okay to hate your pregnancy. A post I never thought I would write. My jealousy for pregnant women has run deep in my heart at times, and even though I say I don't want to be jealous, the pang always jumps up in my mind when I see a pregnancy announcement. This is normal for those on this journey, and if you're nodding your head like "yup, I feel this way every time" - I hear you and I see you. But I want more for you and I. So does Jesus. What I see happening is women walking this infertility journey who finally get their positive will struggle celebrating, all for different reasons. Often they're afraid to share because of a history of loss, afraid because they don't want to hurt their sisters still walking this journey, afraid that they aren't taking advantage of everything this new season is bringing them. What I see more than that is the shame that these pregnant women are holding onto. They've prayed for years for a baby, having gone through medicated cycles and appointments and treatments and surgeries and all the pain that comes with your "no" each month. They swore if they could just get pregnant, they'd never complain. I have seen so many posts about this, followed with "but I hate being pregnant", quietly, like they don't have permission to feel. So many conversations with pregnant women who are isolated and alone because they can't be honest about how their pregnancy is taking a toll on them. After all, they spent YEARS begging God for this very thing, right? Shame does a lot of really wonky things to our hearts, and maybe the worst thing it does is completely wreck our identity. It takes the focus off of who God says we are, and puts focus on "I am a bad person because...". I have heard women say "I am a terrible mother already because I hate this pregnancy", or "I prayed for this for so long and I hate every second of it, my child is going to hate me", or "My friends still trying to conceive are so mad at me, I have the one thing they wanted and I can't appreciate it because I feel [insert physical and emotional pain here]". What this is doing to an entire community of women is creating a cycle that's incredibly difficult to break free from. These women are experiencing a new and very real reality: pregnancy does weird things to your body, and it is hard. By discounting their pain and saying things like you pray for the heartburn and the aches and the literal, physical stretching of your body, you're diminishing their value. And when I say you, I mean me. Because sisters -- yes. I say this in my heart if not out loud, ALL THE TIME. 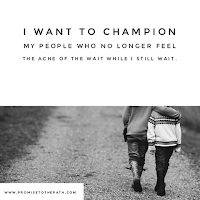 I read an Instagram post today from an infertility warrior now walking in her pregnancy that struck me: she is giving women in this community permission to admit that pregnancy is hard. It's okay to hate being pregnant, even after you've tried so long. It's okay to recognize that you don't feel like yourself, that you're in pain, that you are so sick you can hardly handle it. It's okay to know that your emotions aren't the same, that you have all these new feelings you've never experienced before. It's okay to feel these things - they are real things. Heaping shame on you for not being able to love every tiny bit of the experience will only isolate, and that's the last thing God wants for His children. Let's be real, when I pray for a pregnancy, I'm not praying that I could feel all the hard things. I'm praying for a happy experience, no morning sickness, no heart burn, zero stretch marks, and absolutely no pain in labor. (and all the mamas reading this, I give you permission to roll your eyes or evil-cackle, I get it!) I romanticize pregnancy, believing only the beautiful things will happen for me. 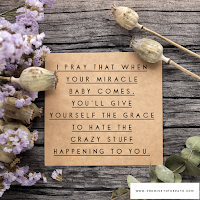 Those of us still walking this infertility journey with all the negative tests, I don't want you to read this and feel bad for having these thoughts. I understand, and it's something I wrestle with all the time. I have an opportunity to talk to a lot of women who have positive pieces to their story that I have yet to enjoy and experience, but it's giving me a huge reality check: pregnancy does not equal fulfillment. Having a child, while life changing, does not sustain the joy you think you'll have. Children absolutely bring joy, I have seen that - but when we put all our hope and expectation in a human, we are setting up for disappointment and heartache. Jesus. Jesus is our hope, our expectation, our faithful One. He has the power to give all the joy, strip all the shame, and sustain us. We can be there for our sisters who have a different kind of hurt now, and Jesus can fill us with the emotional maturity to stand with them. If it's too hard for you, take it to Him, and be honest with your friend. We don't have to be sharp or mean, but honestly saying "I see you and I am so sorry you're experiencing this, but I don't think I am the right person for this conversation right now" is OKAY. It's okay to have that honesty. It's okay to recognize you're not okay - and how lucky are we to be able to take that to Jesus and heave it all at His feet? When we are struggling with our "stuff", we have someone who wants to take it all. Someone recently told me they wanted to walk with me in the season I am in, and they didn't want to force me through it. What a gift that was to hear, and has been to see come to fruition. May we all see the opportunity all around to walk with others, rather than shove them through the season. I am working toward being a better friend and leader this way. I've really gotten it wrong and wounded people in my own shame and hurt and ache, but the beautiful thing is I have the opportunity to do better next time. I will learn from the ways I have hurt others - as uncomfortable as it feels. So, pregnant sisters: I see you. I am kind of jealous of you, but know that does not make me love you less. I am here for you in the ways I can be, and as a woman walking the infertility road without a baby in her belly, I want to also give you permission to live right where you are. I'll meet you there, and we can have food and cry and laugh and live together. Sisters not experiencing pregnancy yet: I love you, I see you, and I understand you in ways only we can all understand one another. I pray for your positive, and your uncomfortable pregnancy. I pray for your swollen ankles and heartburn. 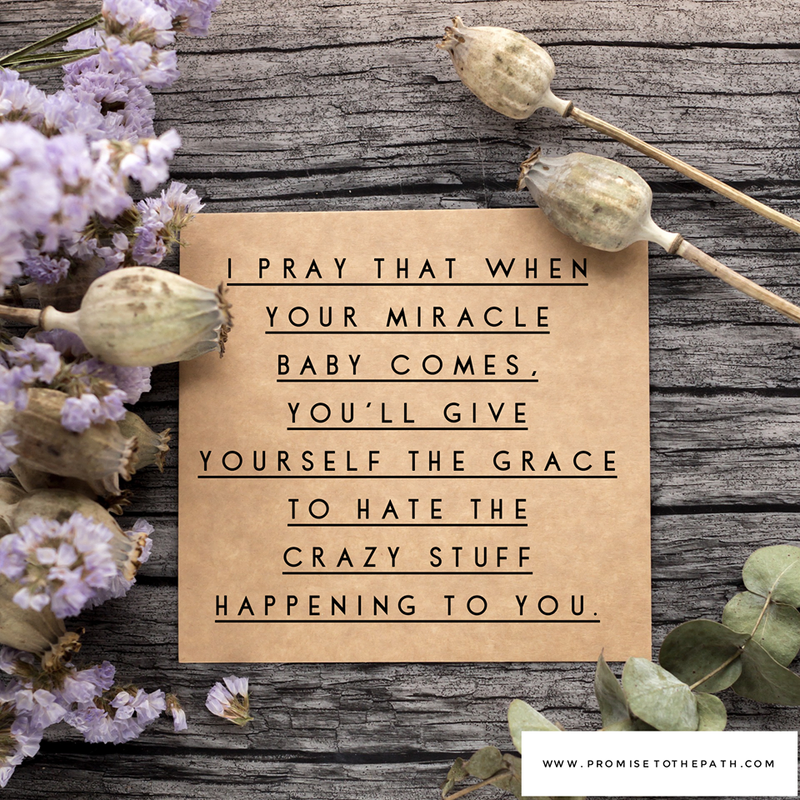 I also pray that when your miracle baby comes, that you'll give yourself the grace to hate the crazy stuff happening to you. May we all give one another a whole lot more grace than we feel comfortable giving.